At the front of the Sympathetic Magic display at the Pitt Rivers Museum, case 61a, is a perforated black limestone beach pebble with a string attached through the hole. 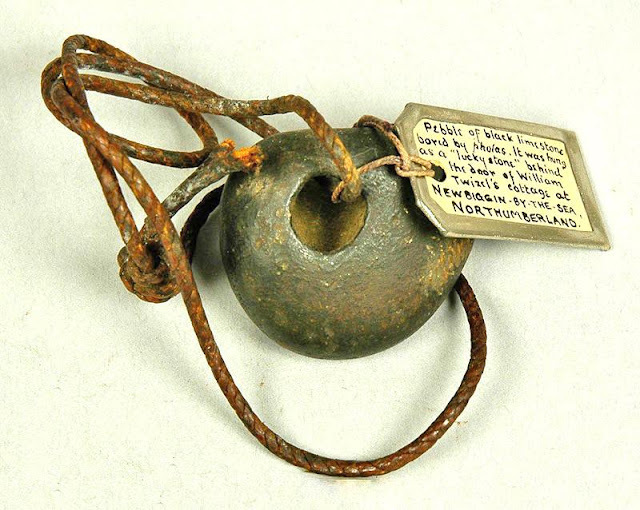 [1908.11.1] The museum’s accession book states that this is a “Beach pebble of black limestone bored by pholas, hung behind a door in the cottage of William Twizel, fisherman, as a “lucky stone”.’ (Humble, 1908). Apparently several of these stones hung by various doors of the cottage. The stone comes from Newbiggin-by-the-Sea, Northumberland, and was donated in 1908 by a Miss Humble, Alexander James Montgomerie Bell, and William Twizel (actually Twizzell) in 1908. There is no mention of a William Twizel in the 1901 census. However, there several William Twizzells (various spellings) in Newbiggin, one being born in 1822 and who died a retired fisherman in 1913. The most likely donor is a William Twizzell who was born circa 1829/1830 and who died a retired fisherman in 1909. Miss Humble is described as a field collector but little else is known about her. Accession records in the PRM say she was a resident of Newbiggin. However, the name is fairly common in the north-east and it was not possible to identify her in either the 1891 or 1901 censuses (england.prm.ox.ac.uk/collector). Much more is known about Alexander James Montgomerie Bell. Born in Edinburgh in 1846 he was an undergraduate at Balliol and matriculated as an Exhibitioner in 1864, gained his BA in 1869 and took his MA in 1871 (Oxford University Alumni 1500-1886). The obituary of Bell describes him as a career academic, teacher, antiquarian, and amateur archaeologist. He worked sometimes as a tutor and had more formal roles as a schoolmaster (Marlborough, Fettes) and college lecturer and examiner (St Johns, Worcester). Alexander Bell was also known for his work and research on the Wolvercote gravels and deposits near Oxford (Nature, 1920). He died in 1920 aged 74 and his artefact collection was sold to the Pitt Rivers Museum. Alexander Bell lived in 1891 with his wife Anna and children Archibald, Evelyn, Mary, and William at Rawlinson Road in Oxford. At this period he was engaged in private tutoring in classics, geography and geology (RG12a. 1166. 87.). The family was still there in 1901 when Alexander held a position of private tutor at a public school (RG13. 1381. 35.). Indeed, Alexander’s son Archibald Colquhoun Bell (born 1886), and who had a long naval career, also became a donor to the PRM around 1920 (england.prm.ox.ac.uk/collector). The Newbiggin stone “…a pebble of black limestone, bored by a pholas, was hung behind the door of William Twizel’s cottage…” (Ettlinger, 1943). Such holed stones were “…evidently regarded as magical as early as the second millennium B.C., as shown by the excavations at Tell el Ajjul (ancient Gaza)…” (Murray, 1943). As such these stones were deliberately placed with three in a room and one in a grave. The hole in the Newbiggin stone was made by a burrowing bivalve mollusc called Pholas dactylus. Also known as the ‘Common Piddock’ or ‘angelwing’ it is similar to a clam and bores into a range of soft rock sub-strata including chalk, peat, clay, and sandstone. This elliptical shaped boring bivalve, which can reach 12cm in length, is found at several sites along the east coasts of Northumbria and Yorkshire. It stays in its burrow for its entire eight-year life-span, it is recognised by its typical whitish colouration and is also known for its bio-luminescence.